ROCHESTER, N.H. — The parents of James Foley stood solemnly on their green lawn Wednesday, projecting a quiet grace as they told the story of their son, a storyteller himself. Despite being haunted by their son’s execution by Islamic State militants, Foley’s parents approached the tragedy with a compassion reminiscent of their son. Instead of anger, there was hope. Instead of regret, there was belief in the importance of his work. Rochester residents, the Foley family among them, were struggling to comprehend the death of Foley, a war correspondent who spent his life immersed in danger, driven to illuminate the human faces of global conflict. It was a sentiment evident across this city not far from the border with Maine, a community whose residents remembered Foley as a brave man carrying the torch of a crucial profession. Islamic State militants distributed a video of the killing that said Foley’s beheading was retaliation for recent US airstrikes in Iraq, US officials said. President Obama, from his vacation retreat in Martha’s Vineyard, spoke Wednesday afternoon about the killing, contrasting the brutality of Foley’s captors with the journalist’s dedication to chronicling life in dangerous places. “He was all about humanizing human struggle . . . and making that known to the rest of the world,” John Foley said, imploring people to remember his son as a martyr for freedom. As a freelancer, Foley had covered Middle Eastern conflict zones for GlobalPost, Time, and Foreign Policy magazines, among others. His drive to chronicle the tolls of war drew him back into the region despite 44 days in captivity in Libya in 2011, his parents said. He had come home to Rochester for his birthday in October 2012 after a year reporting in Syria. His family pleaded with him to stay home, worried for his safety. But, he told them, he had stories to finish and said he would be home for Christmas. He was kidnapped in Syria in November 2012 as he traveled toward the Turkish border, beginning a saga that came to an end with his execution. Because of John and Diane Foley’s deep religious faith, they maintained hope that their son would survive, said the Rev. Paul Gousse of Our Lady of the Holy Rosary parish in Rochester, where the Foleys worship. The parish will hold a memorial Mass on Foley’s Oct. 18 birthday, just one step in the process for people who “are trying to make sense of something that is senseless,” Gousse said. The family awaited a call from Pope Francis Wednesday afternoon. In Foley’s hometown, as news spread of his brutal execution, residents expressed shock and sadness. “It’s horrible. It just doesn’t make any sense whatsoever,” said Jeff Elliott, 51, of Rochester. Though he did not know Foley, he called him a brave, dedicated, and honorable man. DiBernardo, of Jetpack Comics, said that as a father, he struggles to comprehend the enormity of the Foley family’s grief. “I just thought it was the right thing to do,” said Marc Saxby, owner of Collec-tiques, the shop displaying the sign. 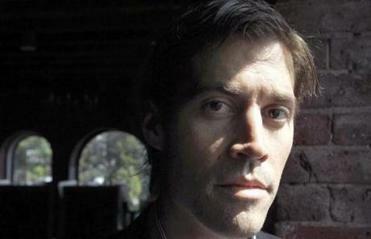 While many were saddened by Foley’s death, a few reacted with anger. The mother of Daniel Pearl, a journalist executed by Al Qaeda in Pakistan in 2002, offered a note of empathy. “Our hearts go out to the family of journalist James Foley. We know the horror they are going through,” Ruth Pearl said in a tweet from the Daniel Pearl Foundation. Material from the Associated Press was used in this report. Claire McNeill can be reached at claire.mcneill@globe.com.